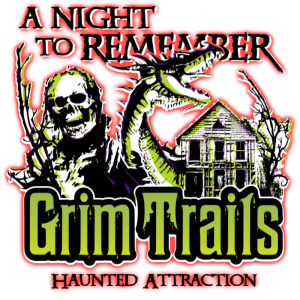 Grim Trails is a Haunted Attraction located in Louisville, KY. 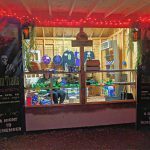 Team Zombillies reviewed this Haunted Attraction on October 13, 2018. 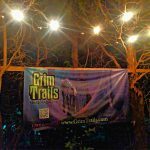 2018 marks Grim Trails’ 6th season in the business of bringing the darker sides of fairy tales and folklore to the Louisville haunt scene. Just when you think these familiar folk tales would be the last monsters hiding under your bed, think again! From the common fables of Alice in Wonderland and The Jungle Book all the way to olde-time classics, including Dracula and the Yeti mixed in with some of Grim Trail’s own creations, we guarantee you will see a lot of characters here that you won’t see anywhere else! 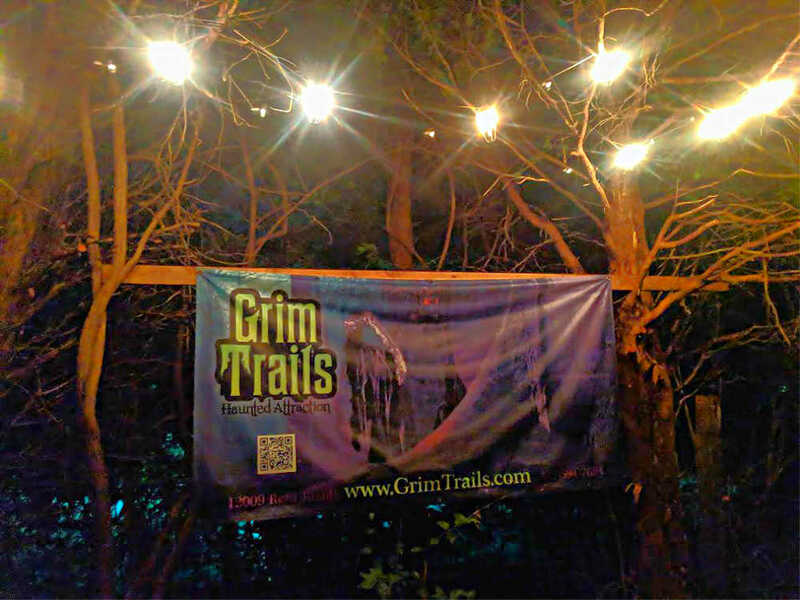 Each year Grim Trails tries to keep it fresh by adding new scenes or repurposing old ones. New additions for this year include Bluebeard’s manor – the tale of a wealthy patriarch with a hard time keeping wives, the cavernous frozen abode of the Himalayan Yeti, and the legendary story of Pinocchio (just to name a few)! 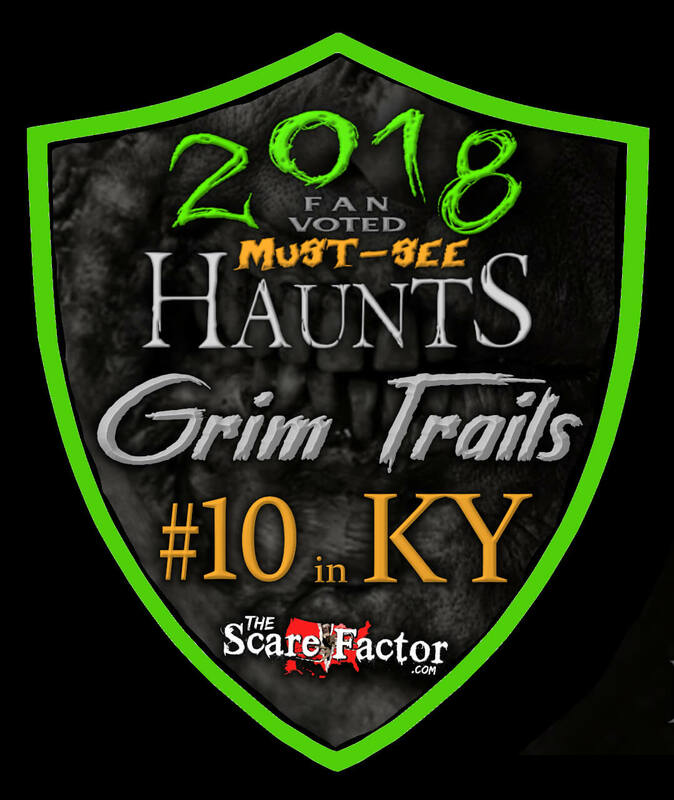 Returning guests will notice lots of other new additions this season, while first-timers will also be in for a treat at this very unique, 3/4-mile-long haunted trail. 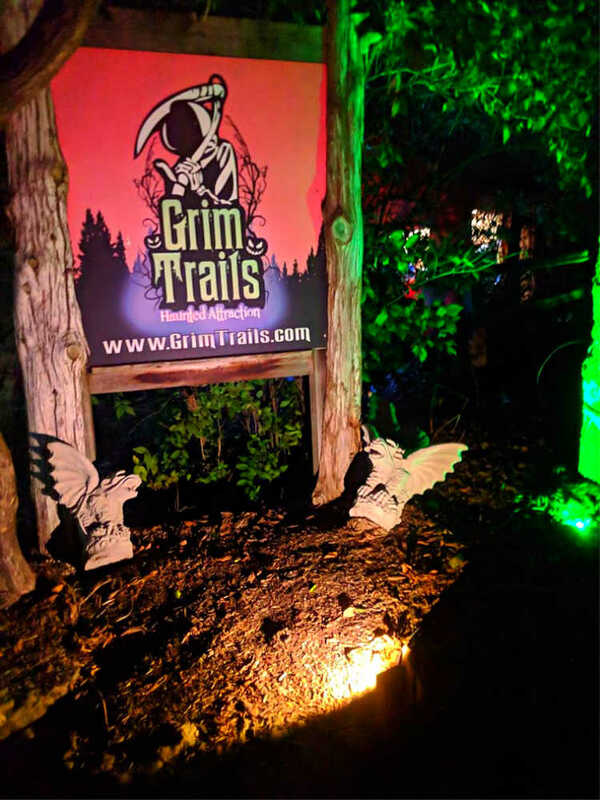 With so many different stories to tell, you can expect to find quite a variety of characters while wandering Grim Trails’ woods. 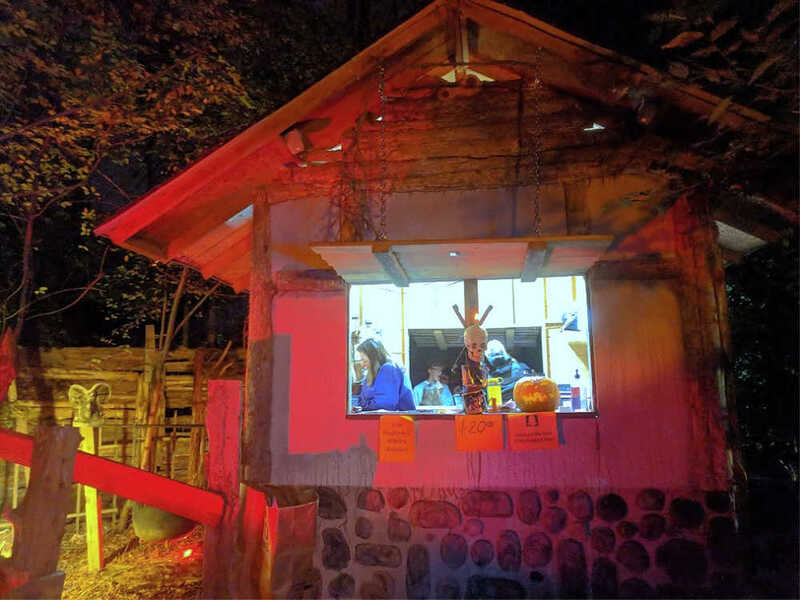 We do need to mention that the haunt was a little short-staffed on the night of our visit, which explains why we found a few “dead spots” during our tour. Though, other areas were staffed with 2 or more actors, which made things seem hit-and-miss along the way. Now, it’s possible that they may hail some more tales as the season progresses, so just be aware that your experience may differ. Just because these monsters fall under the “fairy tales and folklore” genera, that doesn’t mean they’re as friendly as you might think! Bluebeard, Goldilocks and her fuzzy counterpart, many of the witches and the troll proved to be some VERY energetic fiends that gave us some outstanding performances. Each of them were very intense and definitely contributed to the scariness of the show! On top of that, several of them said things to us that matched their characters roles, thier scenes and, on occasion, some of the other actors nearby. As examples, Bluebeard was frantically searching for his missing wife (who was calling out to us for help getting away from him), the troll was climbing all over his bridge, running and growling at us voraciously, Snow White quietly sang her dwarf-related jingle, the bear sniffed us just like a real bear would, and Pumpkinhead had perhaps the most sinister-sounding vocals of the night (save for maybe the troll)! The most interactive duo of the tour was undoubtedly in the Wonderland dinner scene. We thought it was awfully nice of them to offer us some tea… or maybe they wanted to turn us INTO tea!? Either way, they both ad-libbed with us wonderfully as we cautiously made our way through. Another interactive one was Pinocchio. 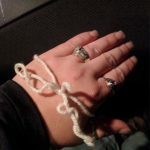 Even though he was mostly silent, he signed to us in clever ways that encouraged us to mingle with him and one of his props. 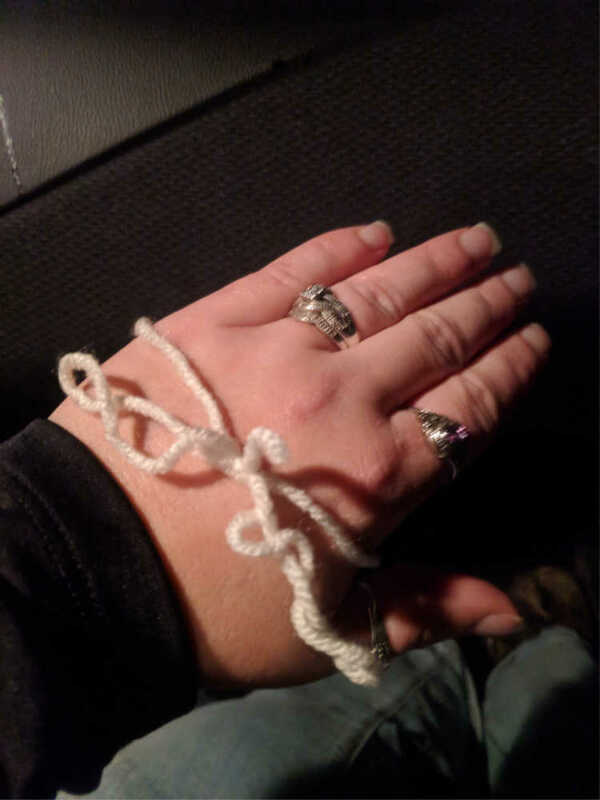 One of us left home with a puppet string wrapped around their hand. Black Phillip charged at us while hastily banging a weapon on nearby objects that we took as a warning to high tail it out of there! In contrast, there were some other malicious miscreants that didn’t seem to be feeling it quite as much that night. Some would slowly creep out at us with subtle growls, or with louder growls or scripted one-liners with no follow-up. It’s possible that these were the lesser-experienced actors of the bunch, though, so this could also improve as the season progresses. 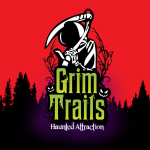 A unique collection of costumes have been created to bring each character to life at Grim Trails. We saw several great masks in use, especially those worn by Kaa, the bear, Black Phillip, the troll and the ghost bride, and each of them looked to be of very high quality. Many of the other characters had makeup with varying levels of detail. 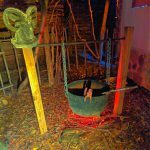 The more-realistic iterations, including the vampires, witches (including Tituba) and the duo in the Wonderland scene, were among the most believable during our tour. Others were a bit more sparing with their designs, but still seemed to fit with their surroundings pretty well. Of course, what really set each character apart was their costumes, and they’ve got some great-looking monsters this year! The Goldilocks Bear, Black Phillip, Dracula and the Yeti were fuzzy from head to toe, the witches and vampires had period-correct, corseted black dresses, and others were MUCH larger than usual. Details extended down to colored contacts, gloves, boots and some were dressed to blend in with their surroundings (don’t trust the rocks or the bushes)! Most of these iconic characters were attired well enough for us to easily tell who they were portraying, but a select few were noticeably undistinguished. 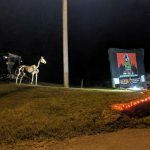 The place is pretty easy to find by way of GPS, but a well-lit sign and a horse-corpse-drawn buggy guard the entrance to Grim Trails and make it easy to spot once you turn on Rehl Road. A flagger immediately directs you around the house to the back parking lot (as long as spots are available), which is free to use and lines have been drawn on the gravel to help keep things organized. 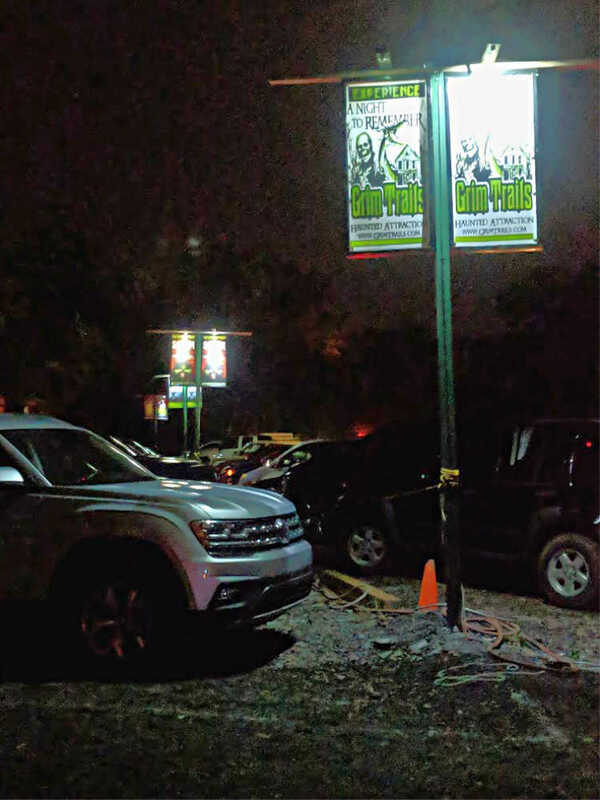 We visited this haunt toward the middle of October; the place was pretty busy and the lot was near its max capacity. With that many cars in this size of a lot and no additional flaggers that we could see, things were a bit of a mess with cars pulling in and out. If you wait to visit until later in the season, be sure to bring some patience with you. 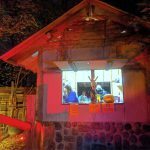 As we followed the lights, sounds, and additional signs to the ticket booth, we walked past an on-duty police officer that was keeping any eye on everything. Friendly staff were found inside the ticket booth that were happy to assist with any questions we had. As we made our way towards the queue line, a friendly photographer with a whole photo booth set up (appropriate for Halloween might we add) took our group’s picture before sending us on our way (photos can be seen and purchased on the opposite side of the ticket booth when you exit the attraction). Once it was our turn to enter, another friendly fiend welcomed us to the attraction and gave us the rules of the trail. She also warned us and showed us a picture of a giant snake that inhabits the property. Navigating the rest of the haunt was fairly easy as well. There are even lights in the port-a-potties! The path from the ticket booth to the entrance of the trail is dark but easy to walk along. 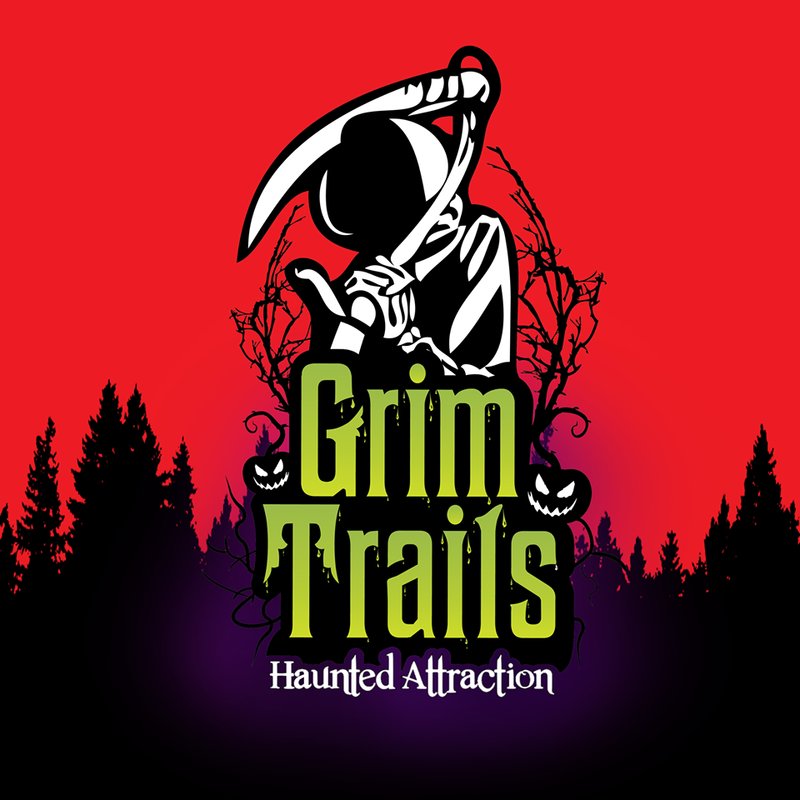 On that note, be aware that Grim Trails is an outdoor attraction where you will be walking along a wooded path through different buildings, across walkways, and there are some steps along the way. It was very easy to get through the path and we didn’t come across any tree roots or other noteworthy trip hazards. The folks at GT have a brand-new gift shop and concessions building this year (lovingly dubbed “The Raven’s Claw”)! In addition to their native offerings, there’s also a separate food vendor (hot dogs were good! 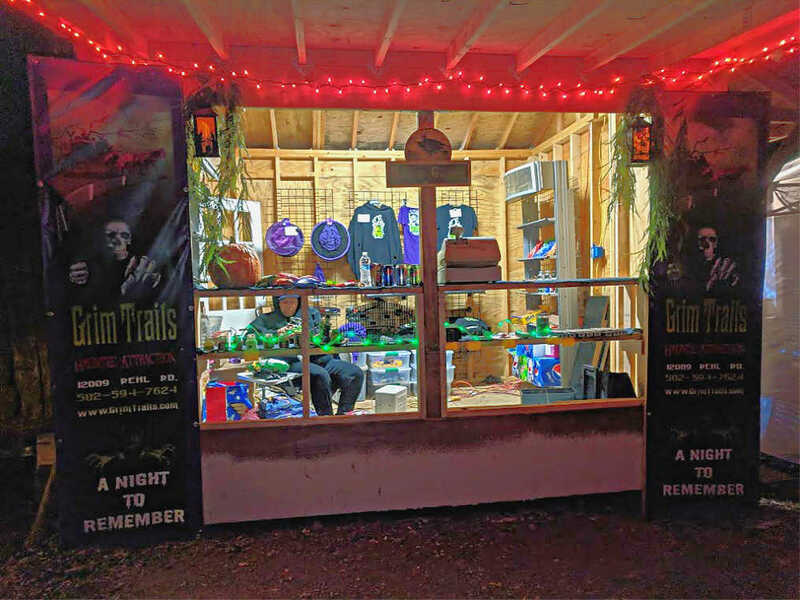 ), and another vendor named “Fairy Tale Fare” with spooky jewelry set up on the trail to the picture purchasing side of the ticket booth. 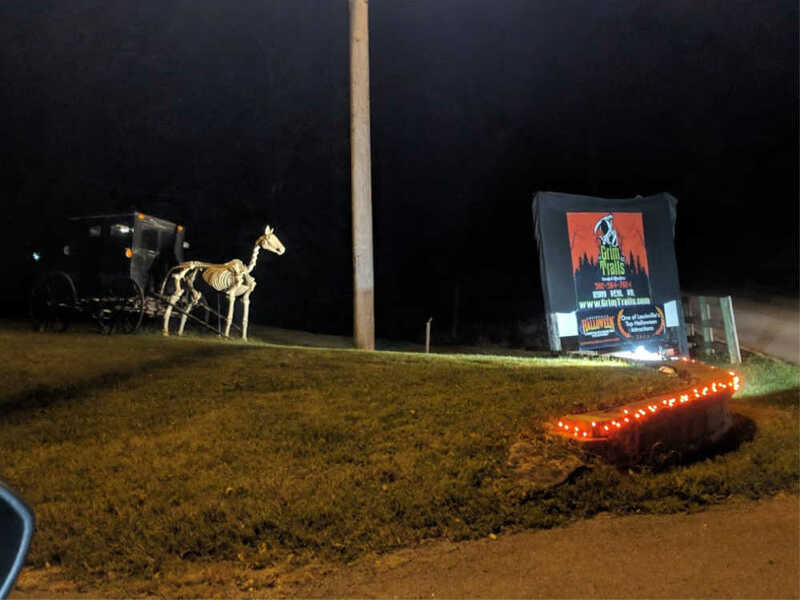 The Grim Trails sign and skeletal horse and buggy kick things off on a spooky note nice and early. Immediately after that, you’ll notice a semi-spookily-decorated house, but follow the signs around to the back. There, you’ll breach a large gateway and find several illuminated banners that display some of the haunt’s iconic characters. Your journey into the woods technically begins before you even reach the ticket booth. Another GT sign, some creepy music and decorations and strategically-placed, multi-colored lights work to keep things headed in a spooky direction. The ticket and photo booths are even clad with rough-cut wood to make them feel right at home in their arboraceous surroundings! However, things really start to take a darker turn as you make your way through the long queue line that leads you deep into the far reaches of the property’s forest. First of all, there are no lights. 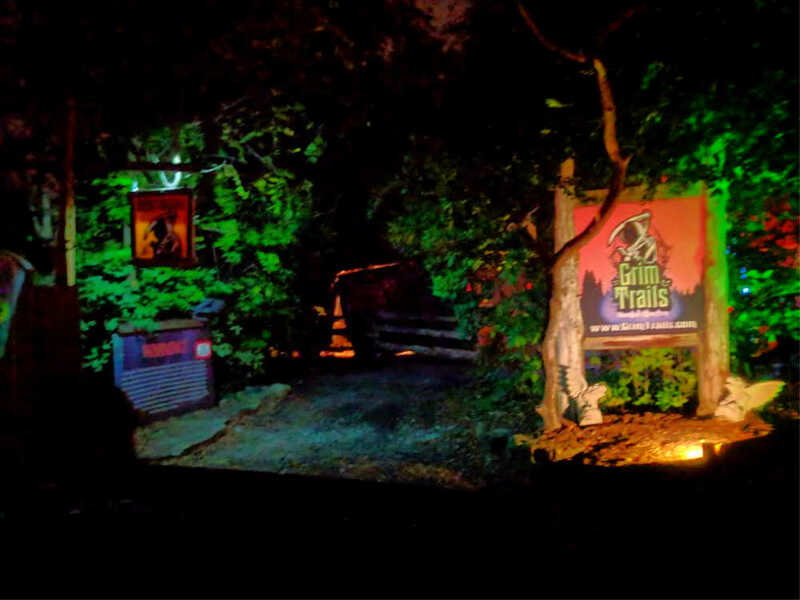 Now normally we would say that the waiting area needs to be lighted so we can see, but at Grim Trails, they really know how to work some magic in the dark and it really helps in setting the mood for what’s to come (get your mind out of the gutter… we’re talking about dark fairy tales here). For this scale of a trail system in such close quarters (we checked them out on Google Maps), they actually do a really good job of keeping each scene in check and minimizing any “overflow.” A mix of several large structures like castles, mansions, smaller houses and shacks, along with wooden walls and sections of black fabric keep your line of sight from reaching out too far and make the experience feel more immersive and realistic. 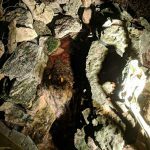 It’s pretty easy to tell where to go once you’re out there, but the entire trail is lined with small ropes and tea candle lights, which serve double duty as tour guides and whimsical touches to the transition areas. Speaking of structures, one of the things that sets Grim Trails apart from other outdoor haunts is their massive buildings. While some are smaller “shacks” with one or two rooms, others were very tall and impressive inside and out! Even the scenery around the buildings was decorated; Dracula’s castle was complete with a large, chained drawbridge and moat, Bluebeard’s manor had some old gas lights lining the stone walkway, a large body of water with a partially-sunken boat was found in the Doll Island area, and the Jungle Book region has lots of exotic vegetation and statues surrounding the temple; you’d almost think these guys are professional landscapers (inside joke… they are). The insides of the buildings are often decorated just as well with authentic-looking props, wall details and furnishings. 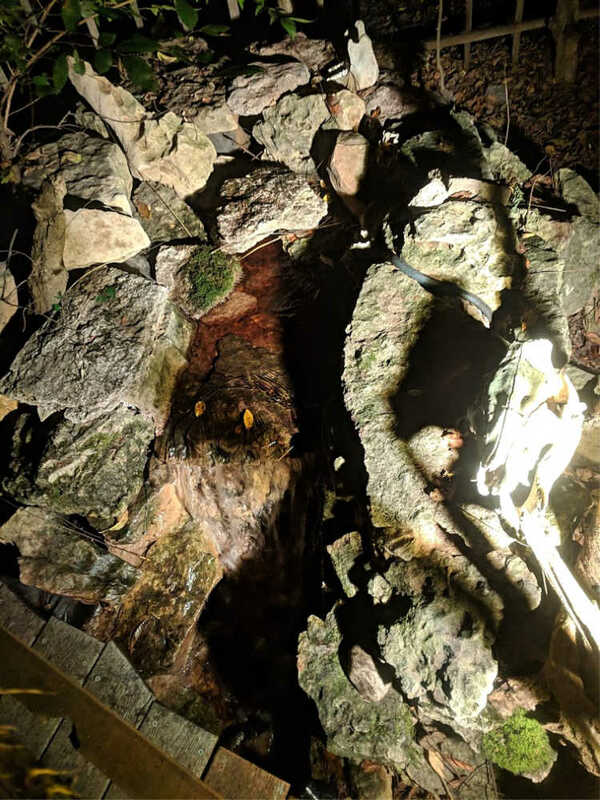 The outdoor scenes can be pretty cool to look at too, with this year’s most notable improvements deriving from the bridge after Bluebeard’s manor and the Yeti cave. The former’s supporting structure isn’t just for show, either, as made evident by the Troll climbing all over it as he was coming after us. The latter appears to be covered in ice with the help of special lights that drive home the illusion of being in the Himalayan mountains! Another stand-out outdoor scene is the Jungle Book, with one particular area that uses a creative water effect that we don’t see very often. Of course, this wouldn’t be a thorough review if we didn’t mention some of the cool props and stuff, right? Along the way, you can definitely expect to run into several animatronics. The scale of these pneumatic nuances ranges from old-school, pop-out-style figures to very large creatures (yes; plural; more than one) that will literally attack you! The best part is, they’re actually pretty well hidden, too… that is, until it’s too late to get away. Most of these are paired with realistic audio effects for added realism; the only exception we might add would be an interesting tree monster that sounded like an angry squirrel… but who’s to say what type of sound a tree’s supposed to make? Lastly, we can’t forget to mention the ambient sound effects that can be heard along the trail. Each of these were great finishing touches to the different scenes they were used in, but they weren’t as easy to hear in some areas. The characters stayed true to their backgrounds only some of them had an extra hint of murderous intentions or anger that we don’t remember from the original tales (you know… like the Mad Hatter threatening to slit our throats with a serrated blade so they could drink our blood, AKA: “tea”). At times, we could hear other groups around us and there was a lot of screaming going on! The trail itself confined us within the twists and trees along the path and, on occasion, we felt as if we were alone, secluded from everything and everyone else. This also allowed for closer, more-natural hiding spots. Our group only consisted of two members, but they waited to surprise us until just the right time to get both of us in most instances. Scares ranged from several acts of victimization (we feel for you Goldilocks and Edith), pitch black areas, shuddering sounds (sometimes from the monsters), and typically-static items that would suddenly move and make noise, to giant beasts that tried to eat us, a bear that got down on all fours to chase us, and additional large, fur-covered creatures that came charging after us. Talk about making us want to retrace our steps! Multiple costumes blended in seamlessly with their surroundings, which proved to be some of the most effective startles here. We also came across a few randomly-placed moving props that we weren’t expecting, such as a hand and a snake. A witch hiding among the trees managed to get us more than once and some suspense was built around the scenes, sometimes with the help of believable victims that warned of what was to come ahead. 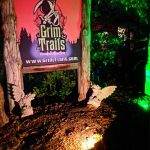 Grim Trails has never been a haunt to run after you with chainsaws or anything like that… and this year is no different. That said, if you’re wondering what happens at the exit, we can assure you that even though we’ve seen it multiple times, their great timing and giant costumes work very well together! This year, they’ve added something extra to the end and you’ll have to visit to see exactly what that is. General admission prices remain the same as last year at $20.00 per body. 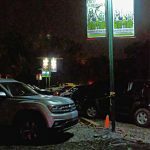 It took us 26-1/2 minutes to travel through the treacherous timbers, bringing Grim Trail’s MPD (minutes of entertainment per dollar spent) rating to 1.33, which is pretty good for the area. 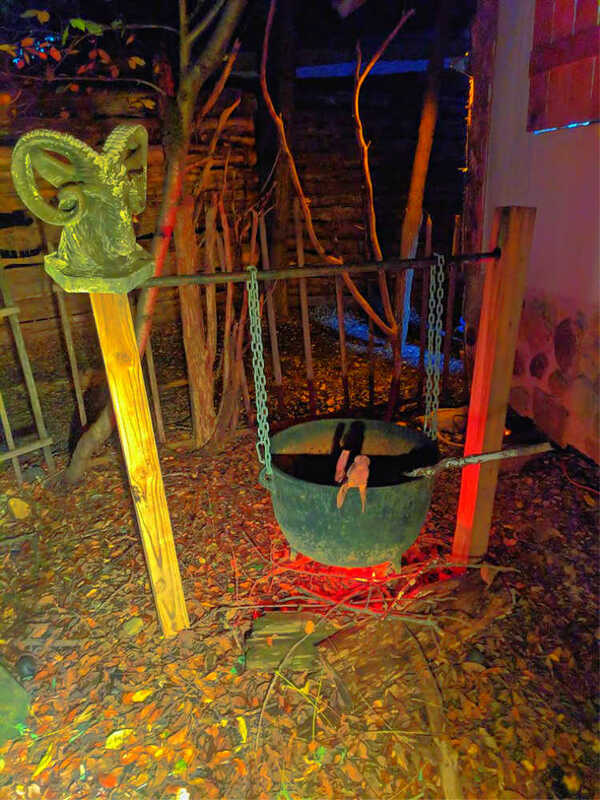 Considering the uniqueness of this haunt, along with the scariness and entertainment provided, you certainly can’t go wrong here. When it comes to queue entertainment, we’ll reiterate that it was busy on the night of our visit and, other than the exceptionally-eerie music bellowing through the queue area, along with witnessing people running out the exit of the trail, we didn’t notice anything else to keep guests entertained while waiting in line. There were multiple places set up to stop and take photos, however, including one that’s closer to the haunt’s entrance. 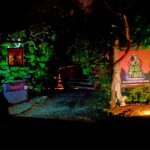 The pricing for Grim Trails is on par with most other haunts in the Louisville area, and it’s actually one of the longest single-haunt attractions in the metro that we’ve reviewed this year. 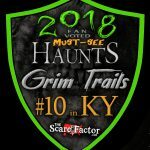 They provided our group with a hauntingly-good and quality show with a great mixture of characters, props, scenes, and scares, so be sure to put Grim Trails on your list of spooky places to visit! This Was Very Scary! I never expected them to get so close!